“As he walked along, he saw a man blind from birth. His disciples asked him, ‘Rabbi, who sinned, this man or his parents, that he was born blind?’” (John 9:1-2). These verses set the tone for the narrative about the healing of a blind man in John 9, a chapter that deals with much more than physical blindness and healing alone. This also applies to the painting. On the right-hand side of the canvas we see the face and hand of Jesus. He spreads some mud of sand mixed with his own saliva on the eyes of the blind man. The man stretches out his left arm to touch Jesus. Who is this man who suddenly appeared out of nowhere? Excitement takes hold of him, his face reddens. Could it be true that there is hope for his life after all? Jesus tells him to go and wash the dirt off, in this way handing the blind man a ritual act that from now on can function as a reminder for him that he is not too sinful to be permitted to see and live. In John 9 the Pharisees with their haughty systems of holiness and sinfulness are contrasted with the blind man. The Pharisees think they see but really are blind. They consider themselves to be without sin but are guilty of pride and misuse of power. The blind man does not see but has a razor-sharp eye for his own sinfulness. He knows he needs a saviour. In this chapter he moves from the confession of Jesus as prophet (verse 17) to Jesus as the Son of Man (verses 35-38). It is striking that Gijs Frieling painted a horizontal stripe in the mud on the right eye of the man. Through this he seems to refer to another image Jesus used when talking about the sinfulness of humankind: that of the log and the speck. He summons us to a confrontation with the log in our eye, so that we may have sufficient understanding of our own sinfulness to help someone else with his speck. No more judgment but compassion. To the left and right of the head of the ‘blind’ man Frieling has painted leaves and blossoms as symbols for healing and flourishing. Above his head we see a vague crown. These images remind me of Revelation 22:1-5: “The leaves of the tree are for the healing of the nations” and “They will reign as kings for ever and ever.” Through his love, which is referred to in the hearts and crosses on the sweater of the man, Jesus had eyes to see this contrite blind man for who he was and could become. 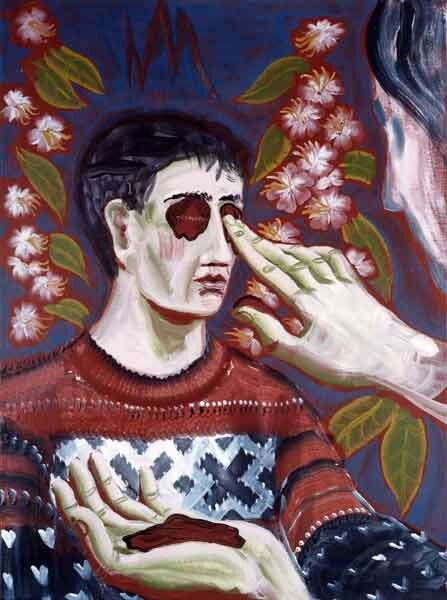 Gijs Frieling: Healing of a Blind Man, 1999.